In the UIImageViewControl Workshop 2, you learned how to fetch a single image from the web, then display it in an ImageView control. In this workshop you will learn how to animate several images in an imageView control. Currently the SecondViewController user interface look image (a) below. When the operator click the Start button, code in button’s startButtonTapped method will do tasks laid out in the pseudocode shown below, resulting in output shown in image (b). The web addresses you see in the textView control point to images that are rotated in the imageView control. 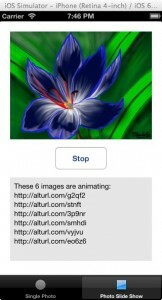 Stop animating (rotating) images in the imageView control. Set the button's title property to display Start. Remove content from the textView control. 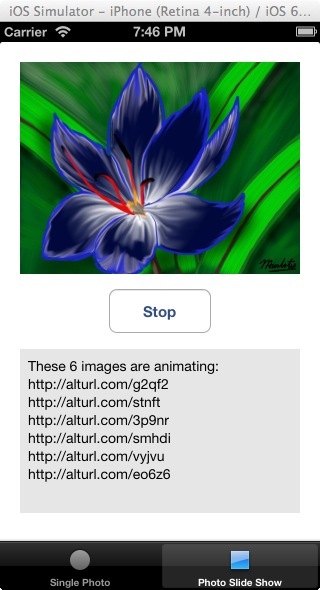 Start animating images in the imageView control. Set the button's title property to display Stop. Convert the array, imagesFromServer to a string and assign it to a variable, stringUrls. in the imageView control, along with content of the stringUrls variable. In addition to placing code in the StartButtonTapped method, we will have to add code in the viewDidLoad method as well. Here is a pseudocode of the method’s code. Initialize the imagesFromServer array with six web addresses. 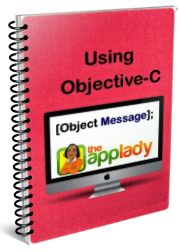 Create and initialize a mutable array called imageObjects. Get the image from the url and place it in the image object called, imageFromServer. Add add the imageFromServer object in the imageObjects array. Assign the imagesObjects array to the imageView's animationImages property. appear in the imageView control. The first thing I want you to do is click the SecondViewController.xib file and remove the checkmark from the textView control’s User Interaction Enabled checkbox. 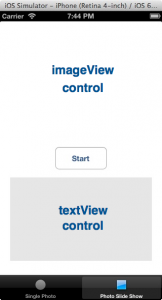 Do the same for the FirstViewController’s textView control. Now, add code shown below in the SecondViewController class. Next, add this code in the startButtonTapped method. Since I’ve commented the class’ code you shouldn’t have any problem understanding it. So run the application, then click the Start button. Code in the else block is executed; thus animate images assigned in the imageObjects array. When you click the button (Stop) again, code in the if block is executed. Notice the slight delay before the SecondViewController’s view is loaded in the simulator window, when you click the second tab. That’s because code in viewDidLoad must fetch all images from the remote server, before loading the view. That’s pretty much how you animate images in an imageView control. Next week, you will learn how to play a sound in the background, while images are animating in an imageView control.